I wish to thank all the people who have commented and shared their experiences with my audience and I this past week regarding the anti inflammatory supplement, Anatabloc. It was so encouraging and insightful! A few people asked why I only started on the lower dose versus the recommended one. To respond, I wished to start slowly because I did not know how my body was going to react to anatabine. I always feel caution is key when starting anything new, especially with your body. But I have upped the dosage to two three times a day this week, and have had no negative side affects. The mild headaches have gone, too. As far as benefits, I can give you a rough overview in a nutshell. I am keeping a more detailed journal to share with my GI in a few months, but I won't bore you with specific details. As always, I notice when I eat my regular diet of low sugar and whole grains v.s. processed food, sugar or refined flour, I do much better in general. Thus, the week started out a little rocky because of my nephew's birthday party last weekend (who can resist birthday cake or Doritos? Well, not me.) But even though I had a little pain and drama in the bathroom, it was not near as bad as it usually is. And once the week got under way, I was back on my healthier eating habits. SO that was good. The past two days, I have had no pain in my gut at all. And completely normal, minimal bathroom visits. Com.plete.ly! I could jump for joy! I also have had a lot less drama in my stomach, especially at night. Allergies for the summer are non existent. I feel like I have wide-open air ways. It's kind of crazy. I have lost 5 lbs. or more and I have a ton more energy. I think quicker and clearer. I am kind of happier and not as stressed out. It's bizarre. Maybe it's the Vitamin D3 in the pill? But I have read that anatabine lessens inflammation in the brain (look at a recent Alzheimer's study by the Roskamp Institute) Maybe I need to make my father take some! I already gave my Mom some for her joints. And here's a subtle thing. I noticed a small, dark age spot that formed a few summers ago on my lower cheek starting to lighten, for no reason at all. Oh, and my husband has seen a marked improvement in his vision. He told me he can see things close up without blurriness. He wouldn't believe it if he wasn't experiencing it himself. Also, his cracked and bleeding feet that have been giving him problems for years with Athlete's foot and swelling have completely cleared up. I saw them this morning and I have never seen his feet look so clear! So that's all to report for now. I am curious to see if the past two days with my happier tummy continues at the level it's at. If so, then this is truly a miracle pill for me. But we'll see. Until next week's check in, peace.
" A few people asked why I only started on the lower dose versus the recommended one. To respond, I wished to start slowly because I did not know how my body was going to react to anatabine. I always feel caution is key when starting anything new, especially with your body." As a long time (the whole time) user of the anatabine supplements, and researcher into them, and writer about them, and investor in the company that makes them, I loudly applaud your health sanity! Modestly famously, I was fortunate enough to help (among others) a very young lady with Chron's who, subsequently, also had such a success story. Chalk up two more for "us", and zero for doctor$, pre$criptions, and in$urance companies. Best wishes! Glad to hear that you are benefitting from Anatabloc. it helps me with arthritis in my hands and feet. I've been investigating Anatabloc and am considering purchasing it. Please don't take this as an insult but I have one question. Is Anatabloc (or Star Scientific, or Rock Creek Pharmaceuticals) providing free samples or anything that can be construed or even mus-construed as compensation for your review? Hi Dan, that is an absolutely valid question and I respect you for asking it. No, we are buying them out of our own funds. 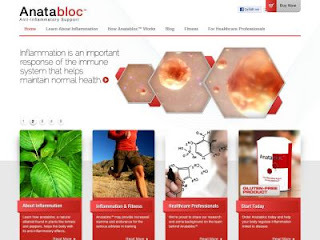 Anatabloc has not asked me to review them or is providing any compensation or samples. I have done reviews in the past and have done them of my own volition, because I love a product and wish to share. I suppose I should have been clearer when I started doing this. Many companies have asked me to review things and they never fit with my belief or lifestyle, so I pass. I was so encouraged by other people's comments on anatabloc on the web, I hoped it would help me. When I decided to do a daily log for my doctor, I figured I was putting the work in anyway-why not boil it down weekly and allow my experiences (good, bad, side affects, etc) to help others? I hope that clarifies things? Thank you for stopping by. I wish you the best!